Everytime I set my tripod up to capture a sunrise over Rocky Mountain National Park I'm in awe of the beauty that encases Rocky. Travel through RMNP and take a good look at the mountains and peaks and it's easy to understand why these mountains are icons not only of Rocky Mountain National Park but also of Colorado. 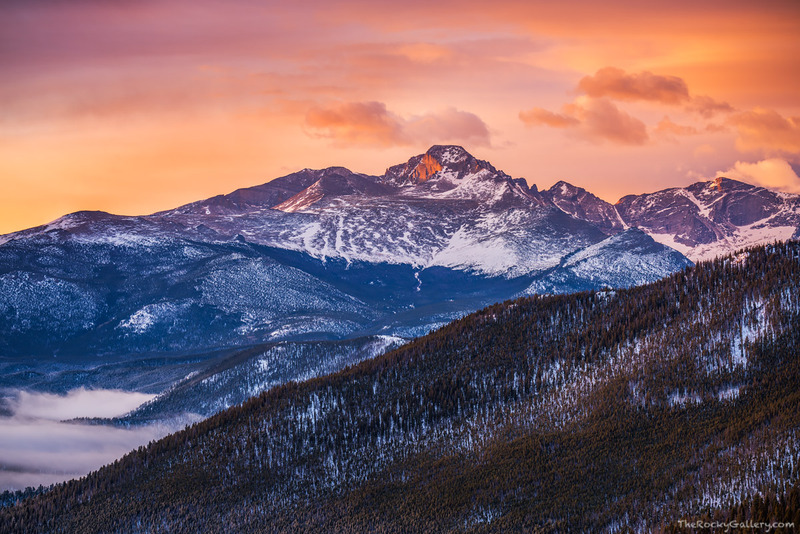 Watching and photographing sunrise this particular February mornign my focus was on capturing Longs Peak, the highest point in all of RMNP. With the dramatic sky The Diamond of Longs Peak shines, but so does the peaks surrounding this part of the park. Pagoda Peak, Cheifs Heads Peak and The Spearhead all add to the imense drama and beauty this winter morning. Photo © copyright by Thomas Mangan.